Adjustments to levels, contrast, hue and saturation. Slight adjustment to brightness. Over two days I took about 30 pictures of this boat from every concievable angle and at just about every point in the sunrise. This one (one of the last of course) had the right combination of sky, color and composition. This is better then I could have hoped for. Finishing with a 7.003 is fantastic. I will be posting a few of the outtakes from this "Boat" series. Some turned out just as good or better but with a little extra post processing (IE: Removing palm leaves) that I could'nt do in the original submission. The reason the palm leaves were in (as many pointed out) was due to the fact that I was trying to hide the frighter behind the palm tree - I must have done a good job since nobody mentioned it - if you look close you can see it sticking out on either side of the tree trunk on the horizon line. Wow, what a shot!!! Very nice indeed! You are right about those palm leaves though, a bit of a distraction but not much. Being a basic challenge you were very limited in that department. About the only other thing I noticed when looking at it is the bump behind the tree right at the horizon line. Is that a rock or island? Again, not much you could do because of the type of challenge. But that is honestly about all I could find wrong with the shot. Love your profile shot, very cute. And looking at your other pictures this was a very nice challenge for you! You have a good eye for this and I can't wait to see you rise in the ranks here. I hope my comments help and good luck in Future Challenges! Jim, Thanks for your comment on my beach entry I thought I would return the favor. Congratulations on your sixth place finish, the exposure on this photo is spot on and way to hide the freighter, not easy to hide such a massive boat, lol. I just wanted say congrats and welcome to the 7+ score no ribbon club. Thanks again for your comment. Hey Jim: a strong composition with great flair in sky and setting sun. Congratulations on your 7th place finish. For the challenge, it may have helped to crop tighter on the left to eliminate the palms and it would also offset your subject. It would have the left side ever so slightly cut off but, imho, would improve the composition and you could also slightly straigten the horizon in the process. Congratulations on your high score and placement. I wish I had a 7! Message edited by author 2006-07-28 08:39:59. Congratulations on your top 10 finish. Beautiful shot! What an awesome photo! Who would have thought a 7.003 could end up in 8th place!! Tells you what a tough competition this was. Congratulations on being one of the best in this competitive challenge!!! This is better then I I could have hoped for. Finishing with a 7.003 is fantastic. I will be posting a few of the outtakes from this "Boat" series. Some turned iout just as good or better but with a little extra post processing (IE: Removing palm leaves) that I could'nt do in the original submission. REALLY wish I was there! Very nice compozition and good lights but colors getting bit unnatural. Great job! I found this to be one of my favorites in this challenge because I feel part of the setting, I love the sky, the colors in it are just gorgeous. I love the subtle-ness of the water, being a minor part of the whole scene, but works so beautifully. I love the movement in the sand, it's as though a million feet have danced on that beach. And I love the solitude that is created by the boat and single palm tree. I gave this a 9, because it met the challenge 100% in what my idea of a beach shot should be. I'd give you a 10, but it wasn't my favorite out of all of the shots. Nice clouds. I don't like the branches of the other tree but that's the only negative thing I see. A classic tropical shot. Doesn't get any better than this! Gives me a holiday feeling. Great sunset, I love the colors. Good composition and has a lovely serene feel to it. Would score slightly better without the additional palm leaves top left. Palm tree against the sky is perfect, and eyes pan down to the docked boat with sun going down. Love it. The sky is beautiful in this. A nit picky thing - the two bits of palm fronds on the top left could be gone. Then this would be perfect. I like this. Simple, good colours. I find it a shame that another palm tree is trying to creep into the picture. This is very nice. I do with that one palm branch on the left was out of there. But really a beautiful capture. the leaves on the left side are a bit distracting and if the boat or tree were just a bit off center it would be an even more compelling image, really like the colors and exposure. I saw this postcard in the store! Nice photo. 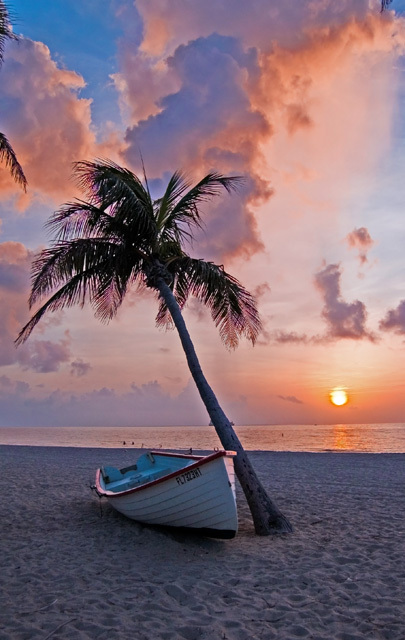 Very tropical, like the tilt to both the tree and boat. Good background clouds, too. Too sharp and something else up in the PP maybe, but a really nice composition. 6. Sweet. Can make of a good poster. I like the saturated colors and silhoutted tree. Goodluck.9. Another beautiful place for a visit. Great! Proudly hosted by Sargasso Networks. Current Server Time: 04/21/2019 02:39:15 PM EDT.